FindSpark (formerly NY Creative Interns) aims to set up every young creative for career success, and provides the largest Meetup for interns and recent grads in the country, we’ve hosted more than 70 events for over 5,000 attendees in the past three years. Find & Follow Your Passion, a full-day career conference taking place on Saturday, November 9th in New York City, is designed to help young creatives discover and pursue their dream careers through a day of panel discussions, workshops led by industry pros, and the opportunity to network with recruiters, future mentors, and fellow attendees in a fun, relaxed setting. I’ve attached the event flyer and would be happy to send you more information if you think any of your students would be interested in attending. They can also use discount code BKCollege for 20% off the ticket price. NY Creative Interns is now FindSpark. Read about the change here. Join us for Find & Follow Your Passion on Saturday, November 9th! Rosen Fellowship – please apply! As director of the Program in Visual Arts Administration at New York University’s Steinhardt School of Culture, Education, and Human Development, I am writing to tell you about our unique master’s degree program that can benefit your talented art history and studio students after graduation and further prepare them for rewarding careers in arts administration in the visual arts field. I hope you will share this information about the NYU M.A. program in Visual Arts Administration with your students. They can also visit our website <http://weblaunch.blifax.com/listener3/redirect?l=608004c4-d8ef-494c-89f0-4eff9666063b&id=7ab0f06a-fd3b-e311-bd25-000c29ac9535&u=http%3a%2f%2fsteinhardt.nyu.edu%2fart%2fadmin%2f%3futm_source%3dmdr%26utm_medium%3deblast%26utm_campaign%3dvisual-arts-admin> and join our email list <http://weblaunch.blifax.com/listener3/redirect?l=903c7079-0f86-43aa-9d66-3d18f15df757&id=7ab0f06a-fd3b-e311-bd25-000c29ac9535&u=http%3a%2f%2fsteinhardt.nyu.edu%2finquiry%2f2014vis-art-admin> to learn more. About the ProgramNYU Steinhardt’s M.A. program in Visual Arts Administration prepares students to become leaders in a broad range of arts organizations. The curriculum addresses the whole art ecology including the cultural environment in which art and arts organizations operate, the role of the artist in society, how artwork is documented, presented, and interpreted, the structure and management of organizations that display artwork – both non-profit and for-profit, and the role of art theorists, critics, dealers, curators, and collectors. A strong emphasis is placed on acquiring the theoretical and practical tools for fundraising, financial management, marketing, and knowledge of new media and technology in the visual arts. Upcoming EventsOur next event of interest is our Art and Art Professions master’s programs campus information sessionon Wednesday, October 30 at 6:00pm. Interested students can learn more and register <http://weblaunch.blifax.com/listener3/redirect?l=94d41de6-0374-4899-ac80-b74ba35231df&id=7ab0f06a-fd3b-e311-bd25-000c29ac9535&u=https%3a%2f%2fsis.nyu.edu%2fpsc%2fcsprod%2fEMPLOYEE%2fHRMS%2fc%2fNYU_EVT_SS.NYU_AD_PRS_ONLINE.GBL%3fADM_RECR_CTR%3dGSTN%26NYU_EVT_SESN_VALUE%3d4473%26Prospect%3dN> . I will also host an M.A. in Visual Arts Administrationonline information session on Friday, November 15 from 2:00pm-3:00pm Eastern time. An RSVP is required <http://weblaunch.blifax.com/listener3/redirect?l=1b33e767-cab1-4977-bf3b-5a083816b8c5&id=7ab0f06a-fd3b-e311-bd25-000c29ac9535&u=http%3a%2f%2fsteinhardt.nyu.edu%2fgraduate_admissions%2fonlineinfosession%2frsvp%2f2013%2f11%2f15%3futm_source%3dmdr%26utm_medium%3deblast%26utm_campaign%3dvisual-arts-admin> . Thank you for helping to make your students aware of the Visual Arts Administration M.A. Program at New York University! If you would prefer not to receive further messages from this sender, please Click Here <http://weblaunch.blifax.com/listener3/unsubscribe?id=7ab0f06a-fd3b-e311-bd25-000c29ac9535&e=MMALLORY@BROOKLYN.CUNY.EDU> and confirm your request. We would like to introduce you to ArtBattles U, a breakthrough opportunity for your students to showcase their talents to their peers and earn compensation for their artwork and time. The core of our experience is a live painting “battle” featuring all college student artists. They are encouraged to be themselves and put their schools in the winning circle. This November, we’ll host a battle in New York at the historic Webster Hall (home to our launch event in April). We’re looking for the best student artists in New York/New Jersey and we were hoping you might have some excellent student artists to recommend to represent your school in this Art Battle. ArtBattles U is a concept based off ArtBattles, the original live painting competition, that started in New York in 2001 by students at the Pratt Institute and SVA. In 2012, we launched the long awaited dream to bring ArtBattles to the college arena with our partners at Campus Evolution. We hope you’ll join in our mission to allow college students to take the stage. Please share the attached Call To Artists or feel free to contact me anytime if you have any questions or want to send any talented student artists my way. I’d be happy to talk with you more. Please stop by Centotto this Friday, 25 October, from 7-10pm for the closing reception for Paul Gagner’s portfolio x appunti show, Re: Documents. Our gathering is part of Norte Maar’s Beat Nite All Stars, a nocturnal tour of ten Bushwick art spaces, the full circuit of which will take you from one extent of the neighborhood to the other before depositing you at a well deserved afterparty. Participating spaces, a map and other details here. 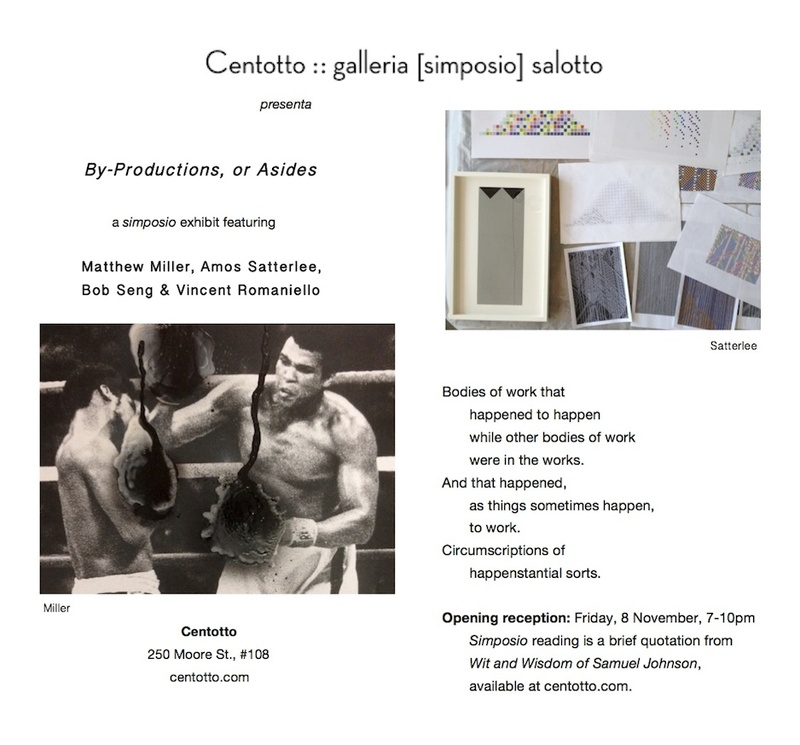 We kindly ask you to also take note of the opening date for our next exhibition, By-Productions, or Asides, a simposio show featuring new works by Matthew Miller, Amos Satterlee, Bob Seng and Vincent Romaniello. It will open on Friday, 8 November, from 7-10pm. More details and a couple images are here and on the flyer below. We are seeking submissions to a logo contest for a new concentration in Maternal, Child, Reproductive and Sexual Health at the CUNY School of Public Health. The submissions are due Oct. 31 (although we can extend this deadline if needed), and the top three selections will receive $250, $150, and $100 respectively. The top selection will be used as our official logo, a good resume builder. The show will remain up until Nov 3rd. 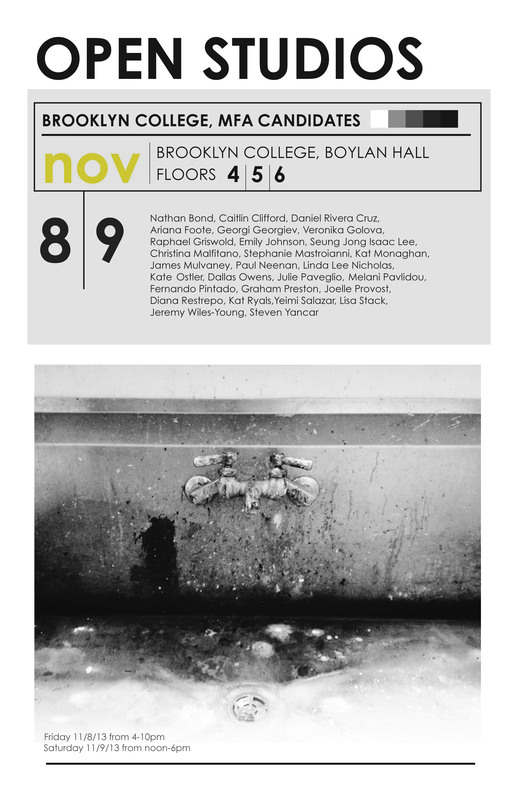 Brooklyn College MFA students and faculty are pleased to announce our Fall 2013 Open Studios event. Twenty-seven current Master of Fine Arts candidates will open their studios to welcome dialogue from the public on their creative processes. On Friday, November 8 from 4-10 pm and Saturday, November 9 from noon-6 pm, MFA students invite visitors to experience their work and creative practice in the intimacy of their studio. These artists represent a broad range of contemporary art making and will be present to field questions on their work. Please join us for this unique event. Boylan Hall floors 4, 5, and 6. 2900 Bedford Ave. Brooklyn, New York. 2 or 5 train to Flatbush Avenue. Please forward along to other interested artists, critics, students, or friends. There is no better—or more enjoyable—way of learning about the world than through travel. In fact, Queens College encourages all students to attend a Study Abroad program at some point in their academic careers. Whether or not they speak a foreign language; many classes are offered in English. Study Abroad options range from relatively short summer and winter intersession courses to programs that last a semester or two. Programs are open to all undergraduate students from all CUNY campuses (unless restricted by level of study, language fluency, or other program criteria). This winter 2014 semester, Study Abroad is offering programs in Argentina, Australia, Costa Rica, Germany, Greece, India, Italy,Japan, Oman, Peru and South Africa. Congrats to the Winners of the 2013 Shaw awards! The Opening Reception for the Shaw Awards Recipient Exhibition will be on Tuesday, October 22 (TODAY) from 6-8pm in the Boylan Gallery, 5th floor. The featured artists are: Amanda Figueroa, Vondel Mahon, Jonathan Lam, Samantha Lee, Kate Sharkey and Rebecca Sutton. The Exhibition will be on display from Tuesday, October 22nd through Sunday, October 27th.